Welcome back to another fun filled episode of Covers from the Unknown! This Friday I present to you a comic that I have had in my PC ever since it was released! It never received the love I feel it should of, and honestly, with the total Number released, I should see more of these out there…..but I do not! 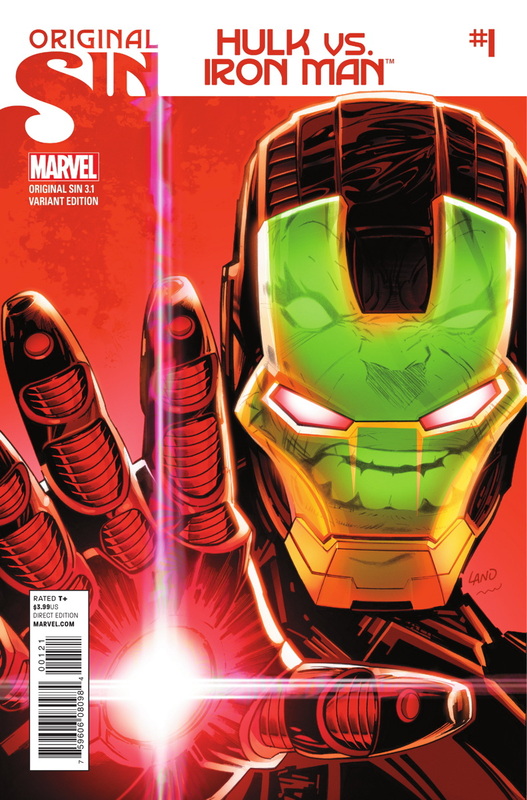 I give you Original Sin #3.1, Hulk vs Iron Man, the 1:10 variant by Greg Land. When I see this cover it screams throw back to Incredible Hulk #340! But instead of Wolverine vs Hulk, we see Iron man vs the Jade Giant! And of course instead of Wolverine's claws, we have Iron Man's shiny helmet! In terms of overall numbers, the normal print has a run of 90k! So definitely not a short printed comic. The variant, being a 1:10 would come in at about 9k. Not short printed, for a variant. If you look around ‘bay and amazon, you can see there are not as many for sale as you would think. The good thing is they will all run you under $10! Spec-wise, I wouldn't expect any movement on this, but it is a definite if you are a Hulk or Iron Man fan! Happy Hunting Fellas! This is sort of the Hulks fault, as he should be smart enough to have picked a a less hostile mirror for checking if he has something stuck in his teeth. No one needs a mirror that shoots them in the face. Thanks for this post Jason. I found this bad boy for a dollar at half price books on Wednesday. I would have never known about it. Thanks for all you guys do. Love the podcast. Keep it up!